First soak the corn, still in its husk, in water for a half hour. Leave the silk intact. 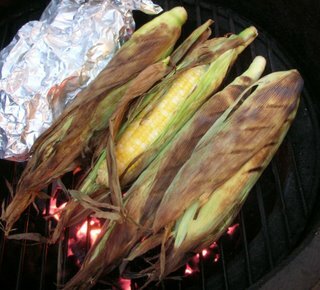 You don't want to break the husk's "seal", plus the silk will peel away easily once the corn is grilled. (We tried both ways, just to see.) Then grill the corn right in the husks. Peel, drizzle with the spiced lime butter and ... dig in! NUTRITION NOTES This is a definite indulgence, for a vegetable. But if you've got lovely picked-this-morning sweet corn, it's worth it. FROM THE ARCHIVES See the Recipe Box for all the recipes for sweet corn. If you like to cook vegetables in foil on the grill, this is a favorite from my cousin Diane, barbecue vegetables oriental. A YEAR AGO THIS WEEK Perfect Rhubarb Pie ... "three perfect rhubarb pies in all of two weeks. The first pie, we groaned. The second pie, we ate in silence. ..."
TWO YEARS AGO Green Beans with Honey Mustard Glaze ... "The trick to these beans ... is cooking them in what seems like a whole lotta water in a whole lotta salt. ... try the beans. They're amazing." Soak the corn for 30 minutes before grilling. Grill over moderately high heat, turning often, til husks are charred all over. Remove husks and silk. Stir together the butter ingredients. Pour over husked ears. Serve and enjoy! Much adapted from Food & Wine, June 2006 - I simplified and re-proportioned but truly must give due credit for an inspired combination to hot Miami chef Michelle Bernstein and her restaurant, Michy's. Yummy, I love grilled corn. With that lime butter I can only imagine the explosive flavor this offers. This is great as I spotted some corn at our Farmers Market on the weekend. Thank you! MMMMMM, I love corn. They don't have as much out here as they do in the Midwest, but I've managed to get my fill. The lime butter sounds like an interesting combo. That sounds delicious, Alanna! But to tell you the truth, I just don't understand why you need butter on corn. In India, we mix salt and cayenne pepper. Then dip lemon/ lime slices in this mix and rub it on corn....soooo good, and no added fat at all. Wow this looks fabuosly delish and I will have to be trying it! Thank you so much. mmm, looks delicious! weirdly enough, ever since i moved to the midwest, i've never made fresh corn. i know. we'll have to do it this weekend.